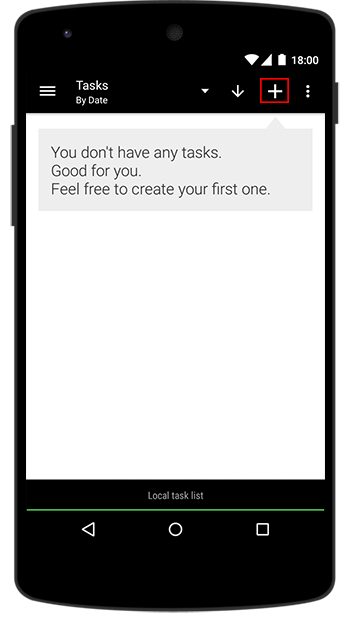 The tasks view gives you a complete list of all your tasks. 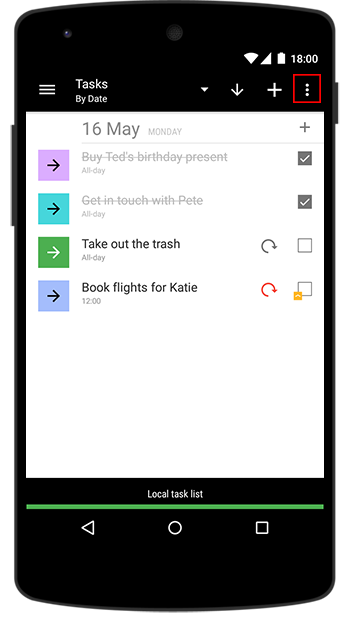 You can see a single task list or all task lists at once. 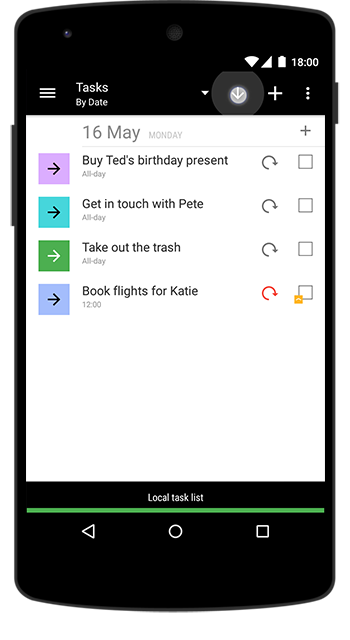 Furthermore there are different sort modes and and the multi-selection feature like the one of the agenda view. To create a new task, please hit the add-new-task-button at the top of the screen. It will redirect you to the input mask for new task immediately. You can use the FAB, to add new event/task, if set accordingly up. To edit a task, please use click the colored box in front of the desired one. You will notice that the box will change its content to a big checkmark. Now the task is selected and you can use the edit-button at the top of the screen to change the task properties. 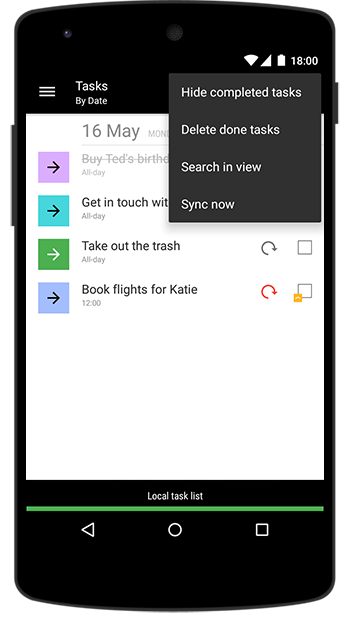 To delete a task just tap the trash-button instead. Hint: Please remember to avoid selecting more than one task at the same time, if you want to use the edit mode. Otherwise the edit option is not available. 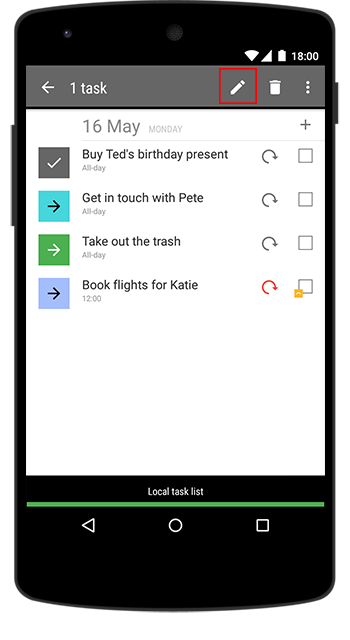 Nevertheless you can select multiple tasks and delete them. At the moment there are four different ways to sort your tasks: date, date reversed, priority and time. The default sort mode for every task list is a chronological one by date. To change the current sort mode, please tap the sort-mode-button at the top of the screen and select your favorite option in the drop-down-menu. If there are a lot of done tasks in your agenda and you don't want to select them one-by-one using the multi-selection, you can also use a special feature to erase them off your task list very fast. Therefore please hit the menu button of your device or use the menu button in the action bar and select → Delete done tasks. Now every task which is marked as done will be deleted automatically. Please note, that the action will irretrievably delete all your done tasks.